Competition is always at the ﬁrst meeting of that month. We start competition promptly at 7:30 pm so you need to have your prints in no later than 7:10 pm. Someone will be available at 7:00 pm to start checking in entries. Separate entry forms are required for EACH category of prints entered. Small prints: Any size print that ﬁts onto an 11 x 14 matboard. Large prints: Any size print that ﬁts onto a 16 x 20 matboard. Digital Projected Image (“DPI”): 2 color, 2 monochrome. Detailed information on entering DPI. To summarize, you can enter up to 2 prints in each of the “Print” Categories (or a total of 8 prints if you enter the maximum in all categories). Mount your prints on the appropriate size matboard (either 11 X 14 or 16 X 20). See article on “Mounting and Matting” for information on the proper mounting of competition entries. Fill out a label for each print with a title of the print, your name, address, telephone number, date, competition class and mark whether it is a color print or monochrome print. Place a ﬁlled-out label on the back side of the matboard in the UPPER LEFT-HAND CORNER. 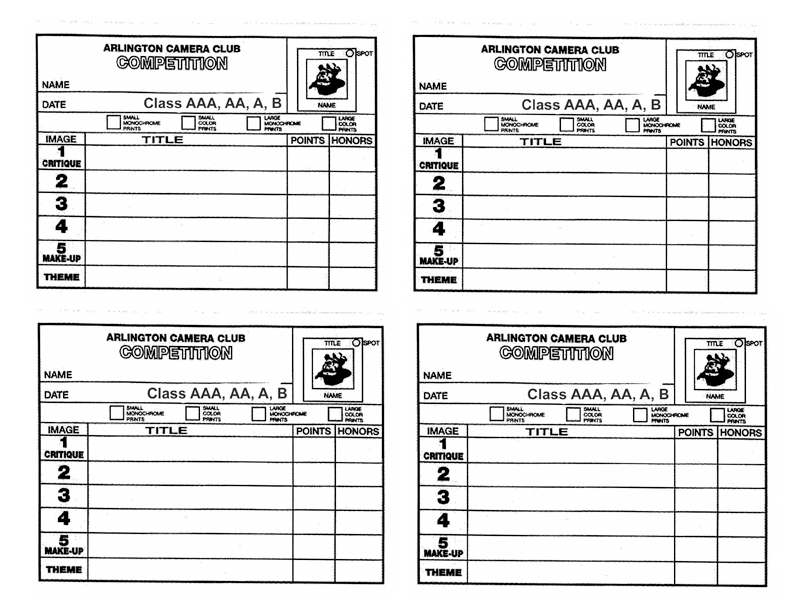 Fill out an entry form for the print(s) with your name, date, class AA, A or B, which category (Small Color Prints, Large Color Prints, Small Monochrome, Large Monochrome) and list the titles of your prints. You will need an entry form for each print category – small color, large color, small mono, large mono. First year competitors are always class B. If unsure as to what class you are in, check with the Committee Chair prior to competition. You can now turn your prints into the person(s) in charge of Prints for that competition night. Your prints will be judged and given a score by the judges. Only entries winning an “Award” can be eligible for the “Color Print and Monochrome Print of the Month” award. Once a print has won an Award or Honorable Mention it must be retired and never entered again in an ACC Competition. This is our last competition of the year. Entries may be large color, small color, Large monochrome, small monochrome as well as Digital Projected Images (DPI). All members are welcome to submit entries. Our program will be "Workshop Night". Several members will have short presentations on photography tools, techniques or tips that they use. There will be some hands-on demonstrations.